Many visitors to this site have submitted questions concerning the Animated STAR TREK series. I have tried to answer all such questions via e-mail, usually within the first two weeks after receiving them. I answer some sooner if I am absolutely sure of the answer. I often check with more than one source before dashing off a response to a tricky question, however. Some questions are particularly interesting or have been asked by several persons. Those questions and their answers are found on this page. Also included in this page are frequently asked Questions that I haven't found definitive answers for. I could, of course, pass on the common rumors concerning these questions, but I only want to provide definitive answers on this page. I don't want to add to the confusion. The Questions Without Answers are at the end of this page. Why do the Klingon ships on the animated series look different that their counterparts on the original series? This question is answered at length on the Klingon ship page. Why don't we see Romulan Bird of Prey vessels in the animated series as were seen in the original series episodes "Balance of Terror" and "The Deadly Years?" The animated series is set around the year 2269-2270 which is after the original series. Sometime prior to the events in the original series episode "The Enterprise Incident," the Romulans began to use warp capable warships of Klingon design. 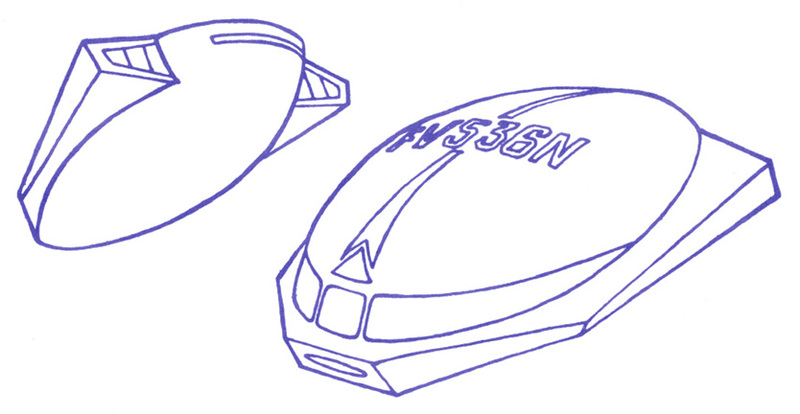 In the animated series the Romulans were seen using these type ships, as in "The Survivor" and "The Practical Joker". By 2269-2270, the Romulans probably still used the older design Birds of Prey but probably not in their encounters with the Federation's finest starships. Is the Animated STAR TREK available on video tape, laserdisc or DVD? Yes, all 22 episodes of the Animated STAR TREK series have been released a number of times. The series was available on eleven volumes of video tapes from Paramount Home Video beginning in 1995. They were priced around $11.00 for each two-episode tape and they can still be found used through Amazon.com. The episodes were also available on a set of 6 laserdiscs that went for about $150. Was there ever a proposed animated STAR TREK: The Next Generation series? Yes, around 1990 Paramount shopped around an animated series that featured original series characters and Next Generation characters. Unfortunately no network or syndicator was interested. Some cel art from the proposed show has turned up for sale at conventions, and the art is reportedly of very good quality. Rick Berman has also been quoted on the subject, saying that an animated Next Generation series would have "diluted the franchise." Why in the cartoon series did they have life support belts when in no other series did that technology exist? This is an easy one. In order to be able to produce an animated half-hour series in the 1970's with a very limited budget, the production company had to take as many short cuts as possible. These include limiting action to a minimum and recycling sequences of drawings. So, rather than draw a new sequence of Kirk and Spock walking with spacesuits on, they would reuse a sequence of the two walking and would just draw on the belts and add a glowing outline around their bodies. During The Animated series, Pavel Chekov was not on the Enterprise, but he was back on the Enterprise in the first STAR TREK movie. Where was Chekov during the Animated Series? The reason Chekov wasn't on the Animated series was money. As many of the original actors as possible were brought onboard to reprise their roles by providing the voices of their animated versions. At first, Filmation planned on not having George Takei and Nichelle Nichols come back to do their roles again. But when Leonard Nimoy learned of their exclusion he said that he would "... not be a party to this if two of the minorities who contributed to making STAR TREK what it was when we were on television cannot be incorporated." It was due to Nimoy's stand that Sulu and Uhura's characters made it into the animated series. Unfortunately with that many star voices, the budget simply didn't allow for Walter Koenig to return as Chekov. But, in the STAR TREK universe, it is reasonable to assume that Chekov went away to receive further training to prepare him to return to the Enterprise as the ship's Security Chief, which he did in STAR TREK: The Motion Picture which takes place in 2271. This is only a conjecture based on the available facts. In STAR TREK IV: The Voyage Home movie, when the Federation council gathered together for Kirk's courts martial among the races present was an obvious feline species. Has there ever been any word on whether this race was related to M'Ress or not? The felinoid race seen in that movie was not of M'Ress' species, but in an interview, the film's makeup people stated that these cat-like aliens were a salute to the animated series. In "The Counter-Clock Incident", why does the reversal of the aging process go so quickly as they are trying to get to the nova? Shouldn't the reverse of their aging process go at the same speed as our aging process? "The answer to the question is that in our universe, the faster you travel, the slower you age (as Einstein told us). In the reverse universe, the faster they travel, the faster they age--or in this case, grow younger. There was an explanation written into the original script, but of course the show is only 21 minutes long on the air, so quite a bit was cut." Why is the Enterprise insignia on the shirts of the uniforms larger and tilted at an angle in the animated series as compared with the appearance of the insignia in the live action series? The chest insignia were drawn stylized. The reason that they were larger than in the series is so that they would be easier to draw when the character's chest is small in the frame. I have some cell art from the comic series. Where can I go to find out how much it is worth, and maybe sell it? I would try an art gallery that specializes in animation cel art. There are some in large cities like San Francisco, New York, and San Diego. In the animated episode "Yesteryear," Kirk and Spock went back into the Guardian of Forever. Didn't Kirk hate that infernal device? Didn't he say, "Let's get the hell out of here," at the end of the "City on the Edge of Forever" (TOS)? What possessed them to go back to that nightmarish planet and step back into that troublemaking contraption? This is a good question. They returned to that place for the same reason that people get back into a car even after having a terrible car accident. The device is simply too useful to ignore. After having a bad love affair and breakup in Paris, one may return to that city again after the feelings have softened. I'll bet Kirk would not have returned if it had been only a few weeks after the Keeler affair, but two years was apparently long enough a time. Where did the pictures of Ensign Chekov, Yeoman Rand, Captain Christopher Pike and Number One on the Timeline page come from, because none of these characters were in the Animated series? I created the images myself to spice up the Timeline page. I also wanted to pay homage to these important character and show what they would have looked like had they been included in the animated series. Why are the episode synopses in this Animated STAR TREK site so short? The episode synopses are sparse because I didn't want to infringe on Paramount's copyright. Commentary about the series and its episodes, and details of the making of the show are allowable use of the copyrighted material. It would, however, be an infringement to write long synopses of the stories. This site is intended as a guide and supplement to the fine Animated series, it was not created to replace the series. I encourage visitors to obtain the episodes on DVD, read the novelizations by Alan Dean Foster, or consult Bjo Trimble's STAR TREK Concordance which has longer synopses. One might also visit the Animated STAR TREK section of CBS Paramount's Official STAR TREK web site. Which actor performed the voices to the most characters? James Doohan by a long shot. Mr. Doohan provided the voices to some 55 characters in the Animated STAR TREK series including Scotty and the semi-regular characters of Lieutenant Arex, Transporter Chief Kyle and Engineer Gabler. On "The Ambergris Element" he did the voices of eight characters and in "Yesteryear" he voiced seven! See the Production page for a list of other Voice Actor Credits. Didn't an Animated STAR TREK episode rip off characters from Larry Niven's Known Space Universe? No. The December 15, 1973 Animated episode "The Slaver Weapon" did feature Larry Niven's characters but the script for that episode was written by Larry Niven. So, since an author cannot rip off his own material the answer is no. For more information, I refer you to the detailed treatment of this episode's relationship with Niven's original short story "The Soft Weapon." I heard that the actors never worked together while recording the voices for the show's characters. Is this true? No. Due to the demanding schedules of the voice actors during the show's production, it was sometimes necessary for actors to record their dialog alone away from the other actor's and then send tapes of their performances to the studio where they could be mixed together with the other dialog to form the show's soundtrack. There was even an occasion in which voice recordings had to be sent in from actors all across the country in order to piece together a particular episode. 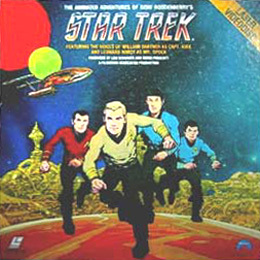 William Shatner, Leonard Nimoy, De Forest Kelley and all the rest of the cast voiced the first three episodes as an ensemble at the recording studio in June 1973. For subsequent episodes, actors would come in and record their lines at different times of the day -- with the actors meeting each other at the studio as one left and the other arrived. Why aren't the episodes placed in Stardate order in the Timeline page? Stardates are virtually meaningless. Stardates were originally created only to remind the viewer that STAR TREK was set in the future, they were never intended to be consistent and there is no official formula that accurately maps stardates to the Gregorian calendar that we use. I seem to remember that McCoy's daughter was seen in an Animated STAR TREK episode. Is my memory correct? She was referred to, but not seen. Dr. McCoy's daughter, Joanna, was mentioned in the October 13, 1973 episode "The Survivor". in that episode, McCoy stated that his daughter was schooling on the planet Cerberus in 2259 when the planet was striken by crop failure. She was not mentioned by name, however. The original draft of the original STAR TREK series episode "The Way to Eden" was written by D. C. Fontana and was called "Joanna." That draft had McCoy's daughter as one of the space hippies. The script was extensively rewritten and her character became Irina Galliulan. The name of his daughter was used in this site because of D. C. Fontana's prominant role as de facto producer of the animated series. How many Animated STAR TREK episodes were sequels to live action episodes? "Yesteryear" was a sequel to "The City on the Edge of Forever" (TOS). It was also a sequel, of sorts, to "The Journey to Babel" (TOS). "Mudd's Passion" was a sequel to "I, Mudd" (TOS). "More Tribbles, More Troubles" picked up the storyline of "The Trouble With Tribbles" (TOS). How many aliens and their ships were seen on the animated series? Klingons - "More Tribbles, More Troubles", "The Time Trap"
Romulans - "The Survivor", "The Practical Joker"
Phylosians - "The Infinite Vulcan"
Kzinti - "The Slaver Weapon"
Orions - "The Pirates of Orion"
Kukulkan - "How Sharper Than a Serpent's Tooth"
Arretians - "The Counter-Clock Incident"
Is the Animated STAR TREK series currently being shown anywhere? Unfortunately not. The Animated STAR TREK was briefly back on the air in 1999. Episodes were last seen on Saturday mornings on Nick At Nite's TV Land - Super Retrovision Saturdaze. A full broadcast history can be found on the Episodes page. Is the soundtrack music from the animated series available anywhere? Unfortunately, no. But STAR TREK is not alone. I don't know of any Saturday morning TV show whose original soundtrack is available. I'm afraid it is not considered a lucrative market. Here is some information about the music on the show, though. The music was not done by Alexander Courage. Background Music was done by Yvette Blaise and Jeff Michael. Music Published by Sherman Music Co. A.S.C.A.P. Music and Sound Effects by Horta-Mahana Corp.
On the Main page of this web site, there is a link to download the opening theme music. Was there ever a STAR TREK animated feature (movie length) production planned? No, never. The animated series was cancelled in 1974, and even if it was somewhat successful, Saturday morning TV shows weren't made into animated movies in early 1970's. The exception to this was He-Man, but the movie it spawned was a live-action feature. Were the characters Lieutenant Arex and Lieutenant M'Ress ever used again in any later comics or novels? Yes. Arex was referred to in one scene in David Gerrold's 1981 novel "The Galactic Whirlpool," but he had no dialogue. Also, on page 13 of A.C. Crispin's 1988 novel "Time for Yesterday," Admiral Kirk made a reference to a Commander Arex. 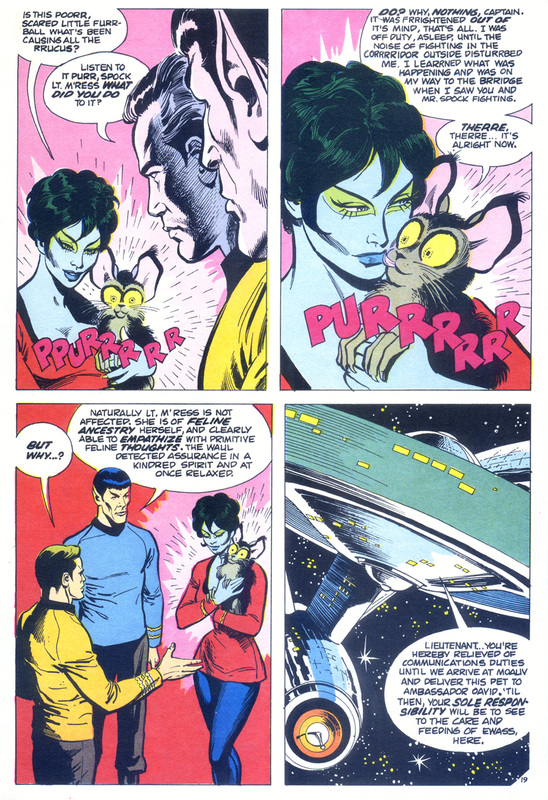 M'Ress and Arex appeared in some late 1980's STAR TREK comics written by Peter David. They came on board with issue #37 (set right after STAR TREK IV) and stayed until #58. Some of these are collected in the graphic novel "Who killed Captain Kirk?" How many guest stars came back to voice their characters again? 1. 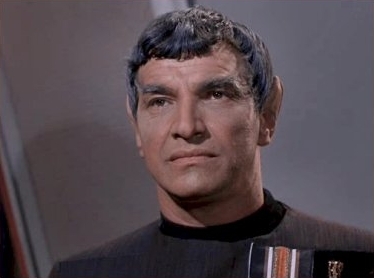 Mark Lenard, who portrayed Sarek in "The Journey to Babel" (TOS), returned to voice Sarek in "Yesteryear". 2. 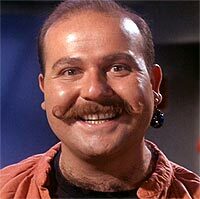 Roger C. Carmel who portrayed Harry Mudd in "Mudd's Women" (TOS) and "I, Mudd" (TOS) returned to voice Mudd in "Mudd's Passion". 3. 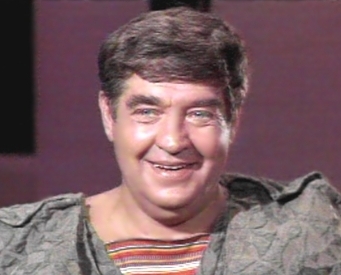 Stanley Adams who portrayed Cyrano Jones in "The Trouble With Tribbles" (TOS) returned to voice Jones in "More Tribbles, More Troubles". Are there any direct tie-ins between the Animated series and the live action series? The Kahs-wan ordeal, which features prominently in "Yesteryear", was a ritual by which young Vulcan males proved their manhood by facing the dangers of the desert wilderness alone. An essentially similar ritual was described in the third season (1995) STAR TREK: Voyager episode "Displaced" (VGR) which was written by Lisa Klink. In that story, Tuvok stated that he took part in the ritual of tal'oth wherein as a young child he survived for four months in the Vulcan desert with a ritual blade as his only possession. It seems clear that script writer Lisa Klink paid homage to the animated STAR TREK series with this reference. In the animated episode "Yesteryear", Spock makes reference to the formidable range of mountains on Vulcan called Vulcan's Forge. Vulcan's Forge was also mentioned in the 6th season STAR TREK: Deep Space Nine episode "Change of Heart" (DS9). Vulcan's Forge is also the title of a STAR TREK novel published in 1998 by Pocket Books. In the November 1998 episode of STAR TREK: Deep Space Nine, "Once More Unto the Breach", Kor mentioned that he served aboard the Klothos, a D-5-class battle cruiser sometime when the Klingons were still the adversaries of the Federation. Kor, of course, commanded the Klothos in the animated episode "The Time Trap." In the 6th season STAR TREK: Deep Space Nine episode "Tears of the Prophets," the Miranda-class starship ShirKahr seen in one battle scene was named after the Vulcan city that was Spock's hometown as mentioned in "Yesteryear." Lastly, Holodeck technology, which became a major fixture in all subsequent STAR TREK series and which was the center of several storylines in the next three series, was introduced in the 1974 Animated STAR TREK episode "The Practical Joker." In Alan Dean Foster's novelization of "The Time Trap" that appeared in STAR TREK Log Four, it was intimated that Uhura had had some bad experiences with Klingons sometime in her past and that she might have problems with the idea of the Enterprise crew working closely with the Klingons in order to escape the area of space that they became trapped in. Yet we never found out what happened in her past. Could you please elaborate? Well, I re-read that portion of Alan Dean Foster's novelization. I have no idea what history Uhura might have had with the Klingons. No such incident between her and the Klingons was ever seen in the original or the animated series. Mr. Foster must have just added that to his story for some reason. There is no canonical basis for the reference. In fact, his novelizations are often peppered with extra and inaccurate details. Could you tell me who voiced Robert April in "The Counter-Clock Incident" and also if the episode establishes when he was promoted from captain to commodore? Robert April was voiced by James Doohan. Mr. Doohan voiced dozens of characters in the animated series including Scotty and Lieutenant Arex. In the episode "The Counter-Clock Incident" it was stated that April was made a Federation ambassador-at-large twenty years before the episode, which places it in 2250. That was the same year that he relinquished command of the Enterprise to Captain Christopher Pike. So in my Timeline page, I put his promotion to commodore in the same year. What types of off-ship vehicles does the Enterprise carry besides the regular Galileo-type shuttlecraft? *The scout was the small ship with a rounded foresection visible at the extreme right of the Enterprise's expansive hanger deck interior in scenes from the episodes "Once Upon a Planet" and "Mudd's Passion." 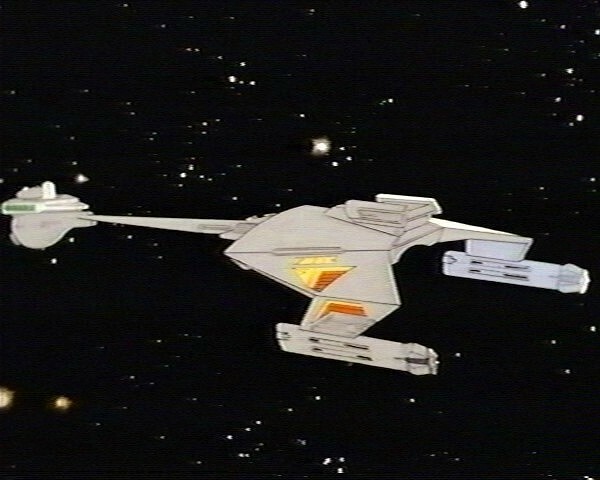 The scout ship (pictured) was a new ship that was designed for the animated series but never used in any episode. Were any of the Animated STAR TREK episode stories derived from another sources? "More Tribble, More Troubles" written by David Gerrold was based on a script he had originally written as a possible third-season Original STAR TREK episode. "Bem" written by David Gerrold was also based on a script he had originally written as a possible third-season Original STAR TREK episode. 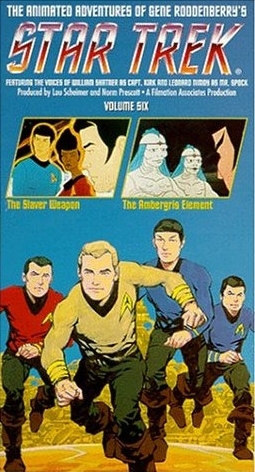 "The Time Trap" written by Joyce Perry was perhaps based on an August 1972 issue #15 of the Gold Key STAR TREK comic series which was published a little more than a year before the Animated STAR TREK episode aired. "The Slaver Weapon" written by Larry Niven was adapted from his 1967 short story "The Soft Weapon." How many characters appearing on the Animated STAR TREK series also appeared on the original series, but whose animated versions were not voiced by the original actors? Tranporter Chief Kyle appeared in "Beyond the Farthest Star" voiced by James Doohan. Kyle was portrayed by John Winston on several original series episodes. Amanda Grayson, Spock's mother appeared in "Yesteryear" voiced by Majel Barrett, after having appeared in "Journey to Babel" (TOS) portrayed by Jane Wyatt. Klingon Commander Kor appeared in "The Time Trap" voiced by James Doohan, after having appeared in "Errand of Mercy" (TOS) portrayed by John Colicos. Klingon Captain Koloth appeared in "More Tribbles, More Troubles" voiced by James Doohan, after having appeared in "The Trouble With Tribbles" (TOS) portrayed by William Campbell. Korax appeared in "More Tribbles, More Troubles" voiced by David Gerrold, after having appeared in "The Trouble With Tribbles" (TOS) portrayed by Michael Pataki. Robert Wesley, former Starfleet commodore turned governor, appeared in "One of Our Planets is Missing" voiced by James Doohan, after having appeared in "The Ultimate Computer" (TOS) portrayed by Barry Russo. I don't remember exactly, but didn't Transporter Chief Kyle appear in the animated series, and didn't he grow a moustache? That's a common misconception. Yes, the character of Transporter Chief Kyle did appear in the animated series. He was seen in "Beyond the Farthest Star", but he didn't grow a moustache. Filmation animators simply drew a moustache on the animated Kyle as if he had grown one. I heard somewhere that the scene near the end of "The Counter-Clock Incident" where Kirk, Spock, Uhura and the rest of the Enterprise bridge crew are all children was intended as a pilot for a new animated Saturday Morning series called "The STAR TREK Kids" and that it was set for production in Fall 1975. Is this true? Good question. I've heard that one too, but after doing some research I've determined that that is only a rumor with no basis in fact. However, several animated series which featured younger versions of popular characters were eventually produced by various animation houses. These included "The Flintstone Kids", "Muppet Babies", "A Pup Named Scooby-Doo", "Little Rosey", "Animaniacs" (kind of), "Tom and Jerry Kids" and "James Bond, Jr." (kind of). On the Episode page there isn't a production number 22012. Also, on the Paramount video tapes and the laserdisc packaging of the Animated episodes, they are listed as 1 thru 11 and 13 thru 23. Was there a 12th episode, and why was production number 22012 not used? Was the missing episode produced, but not shown for reason of content? This question comes up a lot, especially with conspiracy theorists. While it is not clear exactly why a production number was skipped, I am quite sure that there was Never a "Lost" animated episode which might have been produced but never aired. The makers of the Video and Laserdisc packaging numbered the episodes based on the production numbers, which is a bad idea because they weren't aired in that order and there is a missing number. The people who put out Video and Laserdiscs are not production people, they are merely marketers. The information on the video and laserdisc boxes is often erroneous. Production numbers are akin to check numbers in a checkbook - a skipped check does not necessarily mean one was written and lost, but perhaps it was simply VOIDED. Television series production numbers are assigned months in advance of production so that actor schedules, scripts, sets, location visits, billing and credits can be coordinated with the correct episode. This is necessary because during production of a series several episodes are commonly in different stages of production at the same time. For example: Episode #05 may be being finally editted, Episode #06 could be before the cameras, Episode #07 could be having voices recorded, Episode #08 could be in drawing/cel painting stage, Episode #09's script could be in pre-visualization/background creation mode. At the same time, Episode #10, #11, #12 and #14 would be in script writing phase with Episode #13 perhaps being dropped due to a writer's schedule unavailability or some other reason. During production, there are times when scripts are put before the cameras or voiced earlier or later than expected for reasons of scheduling conflicts. This would perhaps cause Episode #14 to be voiced (and subsequently finished and aired) before Episode #10. Missing production numbers are not like missing murder investigation evidence. They are simply reference numbers used by management. Several animated Saturday morning series had a 30 second "message" aimed at teaching the children viewers a lesson, like staying away from downed power lines and not being a bully. I'm not sure, but I heard that STAR TREK had these too. Did they? If they do exist, why weren't they included on the recent DVD release? This question doesn't come up that often, but it is an interesting question because the existence of 30-second public service announcement (PSA) segments would mean there was some lost animated STAR TREK material out there that could be recovered and eventually released. I've done some checking, and it seems fairly certain that there was only one PSA segment made featuring animated STAR TREK characters. It was for the "Keep America Beautiful" campaign - 'Advertising Contributed for the Public Good' and was broadcast around 1975 or 76. It is not clear whether the spot was ever aired during the animated series' original run. Filmation was the first studio to add a moral in the form of an epilogue at the end of animated television episodes. In an interview for Agent DVD Online, Filmation co-founder Lou Scheimer said, "The PSAs were always about the moral in the show, literally to help the child with the concept of the lesson. The idea started with Bill Cosby doing the live-action segments on Fat Albert. It was very effective. We had these superhero shows and at the end the hero would talk about what was in the episode. It created really good will. Mothers were writing in. It was very successful for the kid audience." The reason that episode-specific PSA's were never made for the animated STAR TREK series was because it did not feature physical violence which might require a special moral in the form of lesson-giving epilogues to provide balance. The actual PSA and several that I created can be found on the STAR TREK Public Service Announcement page. Who created the characters of Arex and M'Ress and who designed their appearance? I don't know. Don Christianson, the show's art director, had a hand in most of what the audience saw on the screen, but I can't say for sure who designed any particular characters. As for who came up with the idea for Arex and M'Ress, it was probably D. C. Fontana or Gene Roddenberry, but again, I may very well be wrong. I will look into this further.